I've made the chickpea patties before, but wanted to make a few adjustments to the recipe. 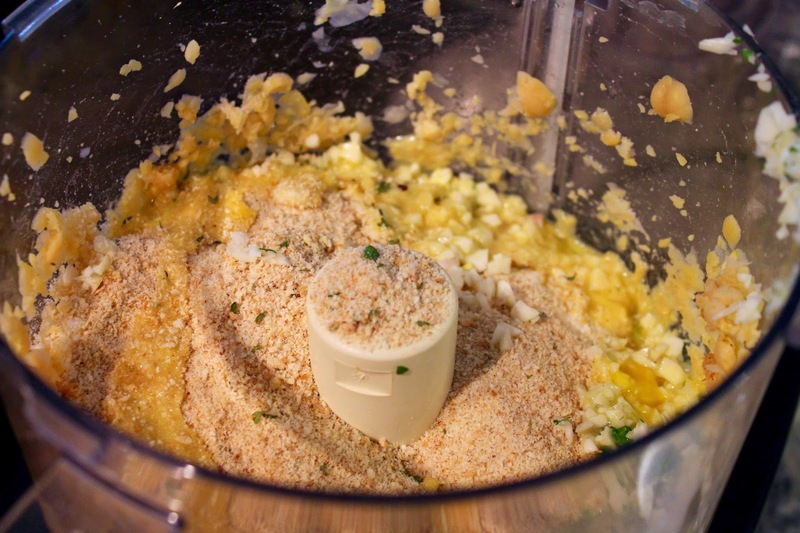 Instead of mashing the chickpeas with a pastry blender, I used a food processor for both this step and mixing the ingredients into the dough. I also changed the seasoning mix just slightly, adding cumin and aleppo pepper, my new favorite pepper that I seem to keep reaching for instead of the trusty red chili pepper flakes. 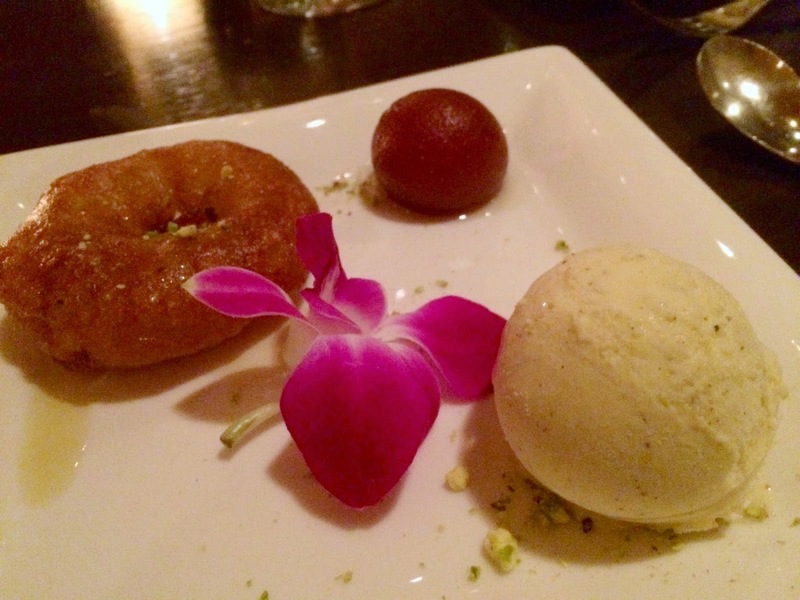 Using a food processor turned out to be an inspired idea. Pulse the chickpeas first a few times to break them up, then add the remaining ingredients before pulsing until the dough comes together. 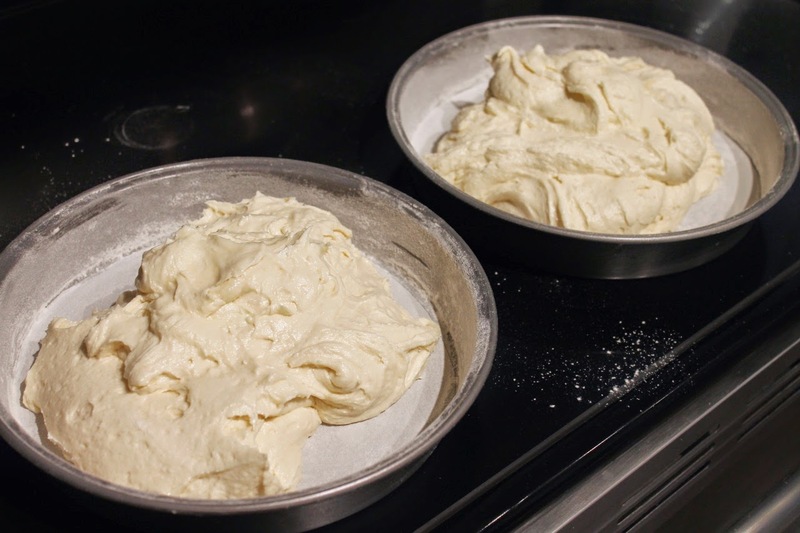 Turn the dough out onto a plate or cutting board--you just need a work surface. If there are any dry spots that didn't get mixed well in the food processor, use your hands to work them into the dough. Then shape the dough into patties. I formed balls that were slightly larger than golf balls, then flattened them into discs about 2-3 inches across and 3/4-inch thick. This recipe should make enough dough for about 10 patties. 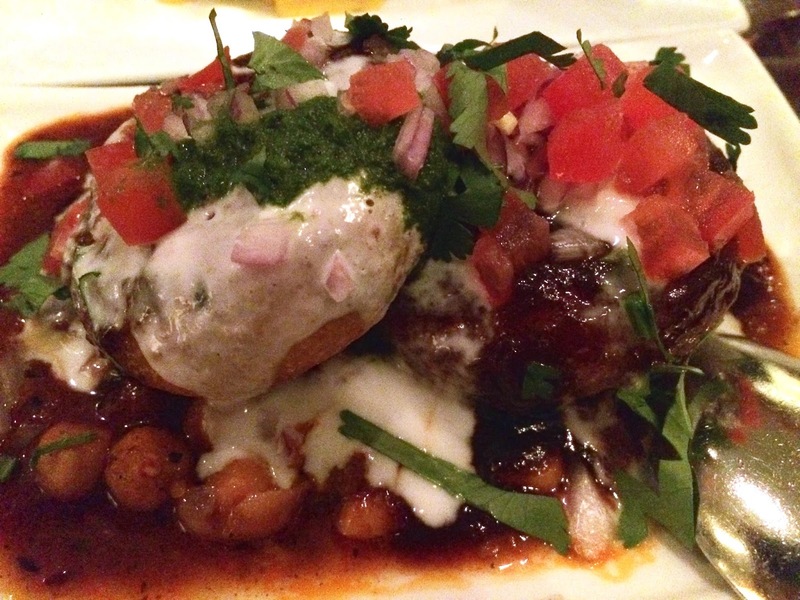 When it comes to garnishing the patties, you have lots of options. 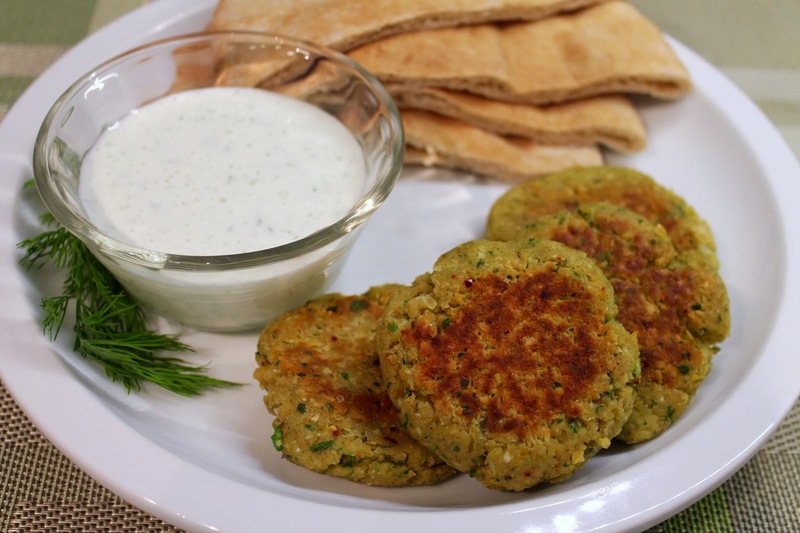 I like to serve them with pitas--either whole-wheat or white--and tzatziki sauce. 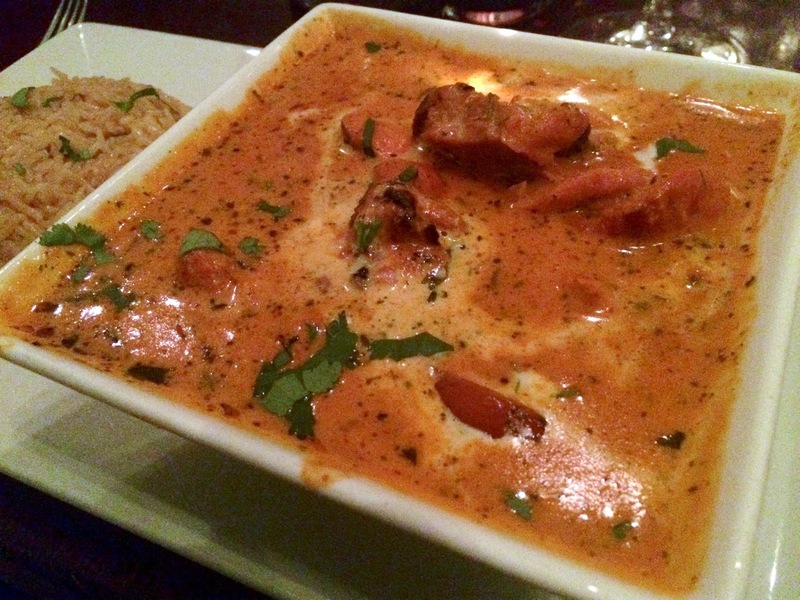 We also enjoy having a little hummus with them, which is, admittedly, chickpea overkill, but it's tasty. If you wanted to add some vegetables to the mix, sliced cucumber or, when in season, tomato would be good. Maybe some red onions, quick-pickled if you have the time. 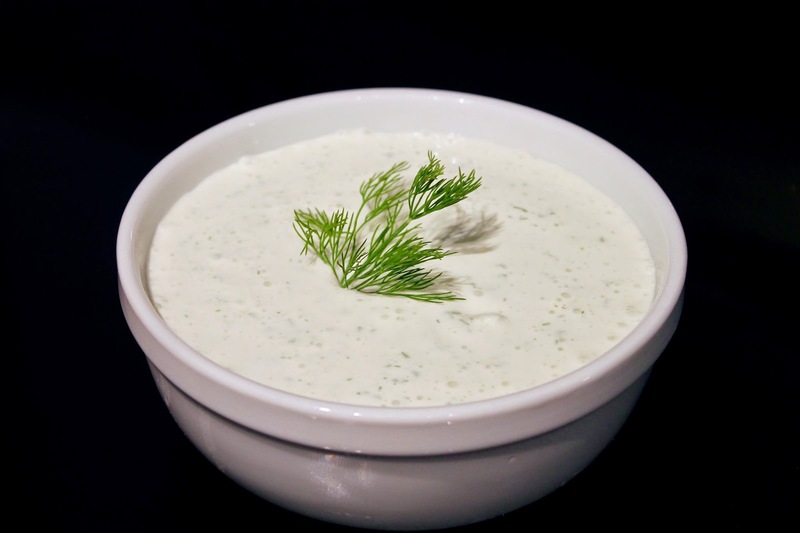 Let's talk about tzatziki sauce for a moment. Many recipes call for straining the yogurt by placing it on a colander with a few layers of cheesecloth. This process, which is both time-consuming and a bit messy, results in thicker yogurt by straining out the whey. The thing is, this step really isn't necessary. Just start the recipe with Greek yogurt instead of the traditional and it doesn't need to be strained. If your recipe says to strain yogurt, it's probably because it's an older recipe written before the recent Greek yogurt trend has made it so readily available. Yes, there was a time Greek yogurt was hard to find, hence the straining. 1. 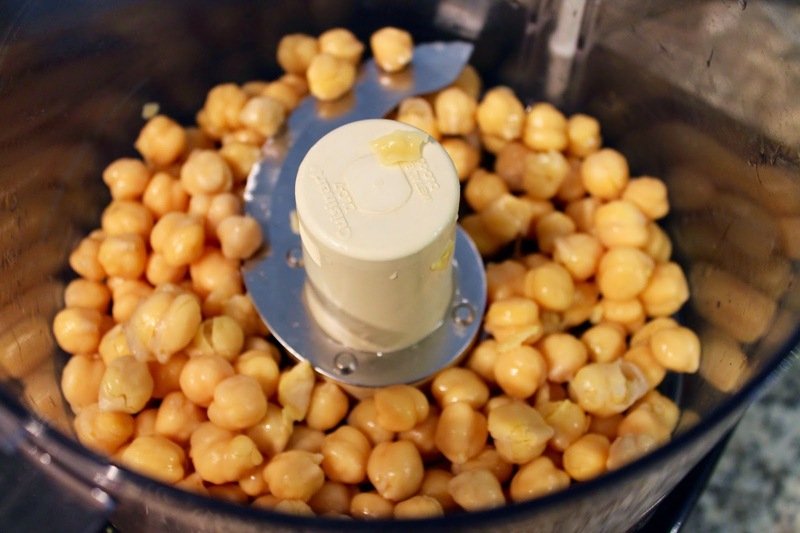 Add chickpeas to the bowl of a food processor and pulse a few times until coarsely ground. Add the eggs, bread crumbs, parmesan, parsley, scallions, aleppo pepper, cumin, salt and garlic and pulse until the mixture is combined. Transfer to a plate or bowl and work with your hands to ensure the ingredients are evenly mixed. Form into 8 to 10 patties (aim for something slightly larger than a golf ball and then flatten slightly into discs about 3/4-inch thick). 2. Heat 1 tbsp. olive oil in a large frying pan or skillet over medium heat. Add half the patties and cook until well browned, about 5 minutes. Turn the patties over, flatted slightly and cook another 3 to 5 minutes. Remove from the pan, add the other tablespoon of oil to the pan, and repeat with the other patties. 3. Serve patties with pita bread, tzatziki sauce and, as desired, hummus, cucumber slices, tomato slices, feta cheese and olives. 1. Place the diced cucumber in a colander set above a shallow bowl. Sprinkle evenly with the salt, place a heavy bowl on top of the cucumbers to weight them down and allow to sit for 30 minutes. Discard the liquid, wrap the cucumbers with a paper towel and gently squeeze to remove additional moisture. 2. 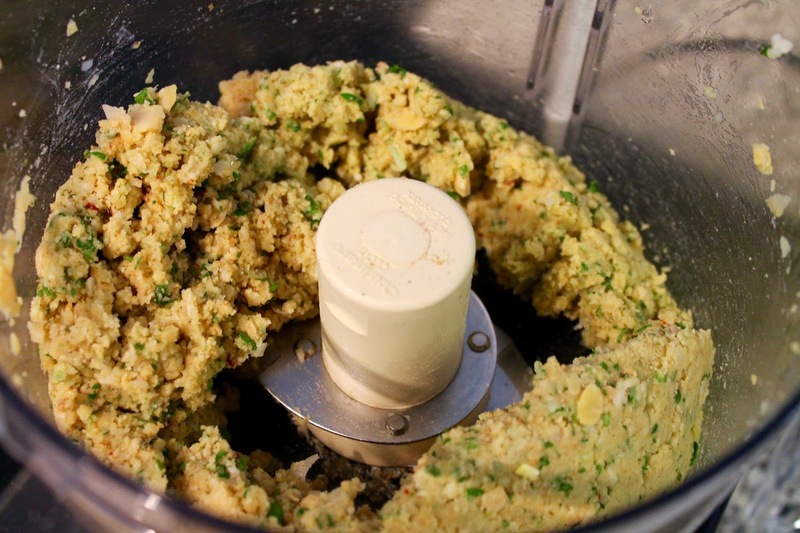 Transfer cucumbers to a food processor. Add yogurt, garlic powder, lemon juice and dill. Blend until combined. Chill covered in the refrigerator until ready to serve. This is a pasta dish that manages to be both hearty and spring-like. 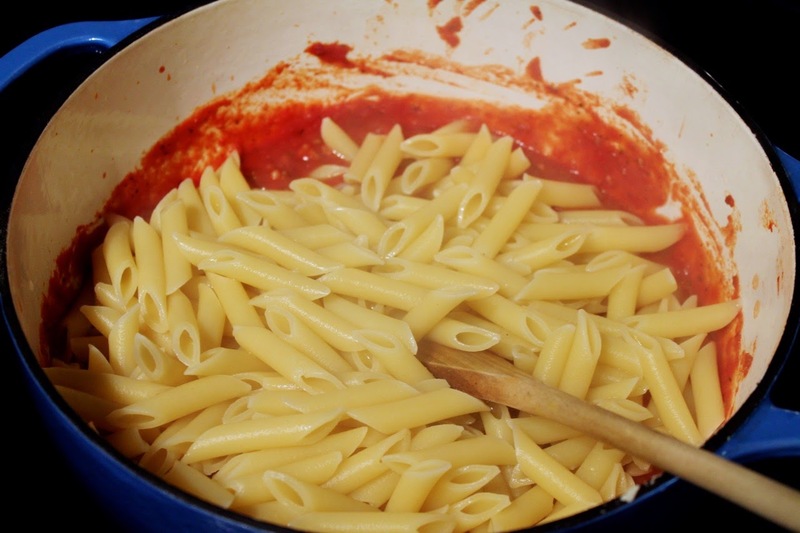 Rather than a thick tomato sauce, you use some of the pasta cooking water to make a lighter sauce that combines with the butter and pan juices. 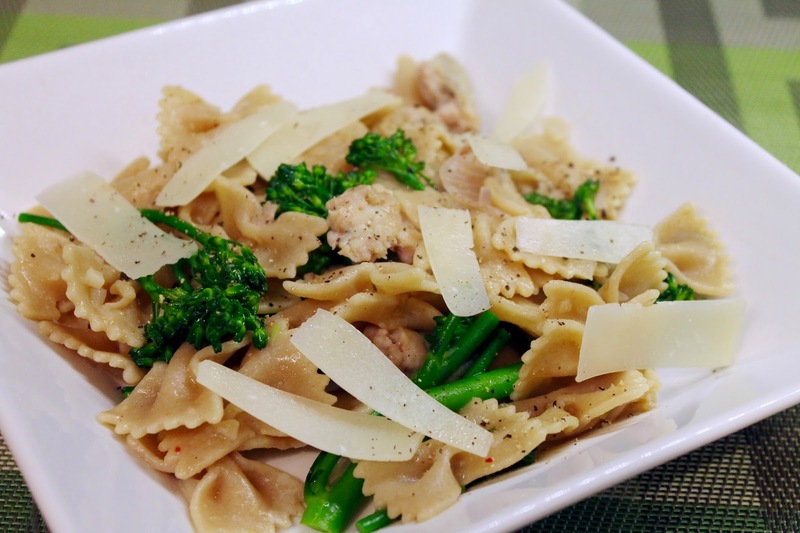 Yet the combination of whole wheat pasta, sausage and broccolini packs a lot of flavor. 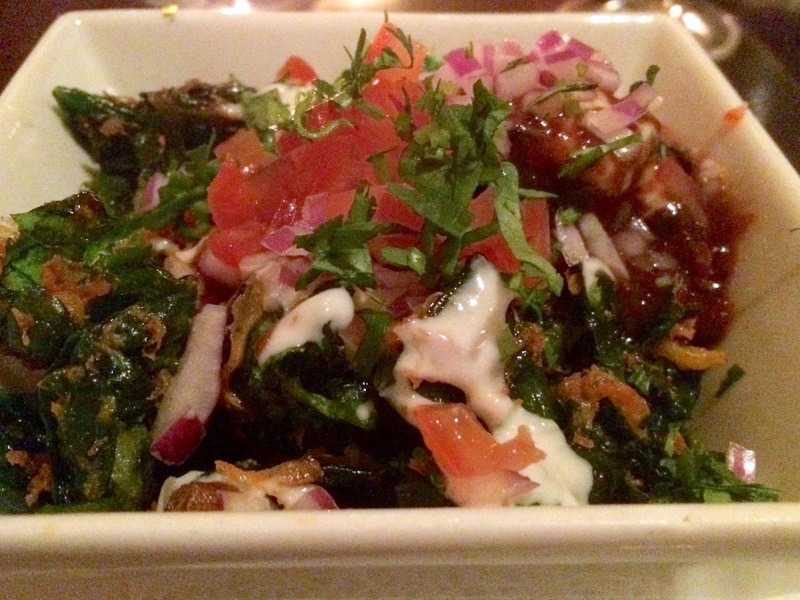 Do you ever get broccolini and broccoli rabe confused? Broccoli rabe, also called rapini, is a bitter green with small buds that resemble broccoli florets. 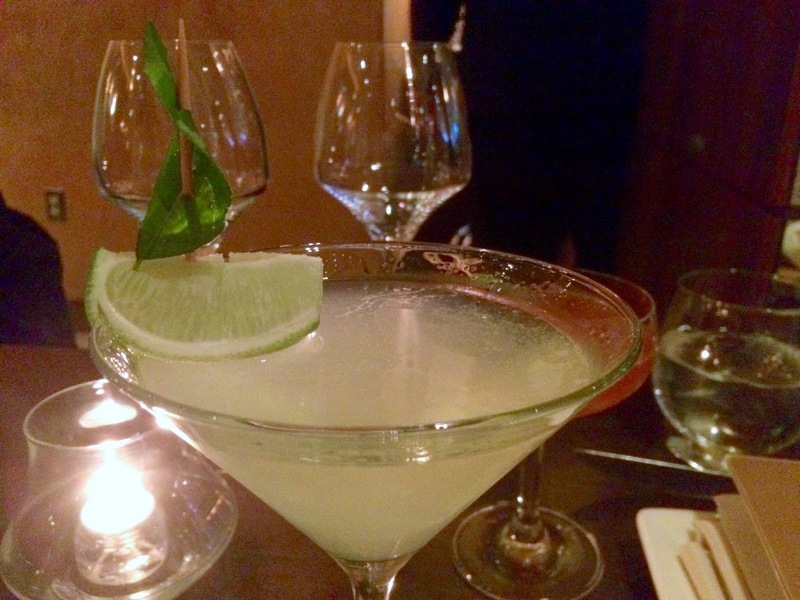 It's species is known as brassica rapa, which also includes turnips, napa cabbage and mizuna. Broccolini was created in 1993 as a hybrid between broccoli and kailan, a green also known as Chinese kale. Broccoli, kailan and broccolini are all subspecies of brassica oleracea, making broccolini a closer kin to broccoli than broccoli rabe. To give this dish some heat, I used aleppo pepper, a spicy red pepper from the Mediterranean and Middle East. It's commonly sold as crushed flakes, making it similar to red chili pepper flakes but with less heat. So where you might use a generous pinch of red chili pepper flakes, you might want to use 1/2 tsp. or more of aleppo pepper. 1. Remove the about 1/3 of the broccolini from the stem end and discard. Cut the remaining broccolini in half. Bring a large pot of water to boil. Cook the broccolini in the boiling water for 1 minute, then remove. 2. Add salt to the boiling water. Cook the pasta according to package directions. Reserve 1 cup of the pasta cooking water, drain the pasta and set it aside. 3. Heat 1 tbsp. olive oil in a large skillet pan or Dutch oven over medium heat. Add the sausage and cook, breaking up with a wooden spoon, until lightly browned. Remove sausage from pan. 4. Add 1 tbsp. olive oil to the pan. Add the shallots and garlic and cook until the shallots have softened, about 5 minutes. Add the aleppo pepper and broccolini and cook another 2 minutes. Add the pasta, sausage and reserved pasta cooking water. Stir to combine and cook a minutes or so until the ingredients are heated through. Turn off the heat and add the butter. Stir to combine as the butter melts. 5. Serve pasta in shallow bowls topped with shavings of grana padano or parmigiano-reggiano and freshly ground black pepper. Aren't tacos just the best? Pretty much anything tastes good wrapped in a warm corn or flour tortilla, whether it's something traditional like Carnitas Tacos of the delicious fusion of Korean tacos (or the wacky but lovable Ramen Noodle Pork Tacos). Every taco dish I've featured to date has included some kind of meat: beef, pork, turkey, chicken or salmon. 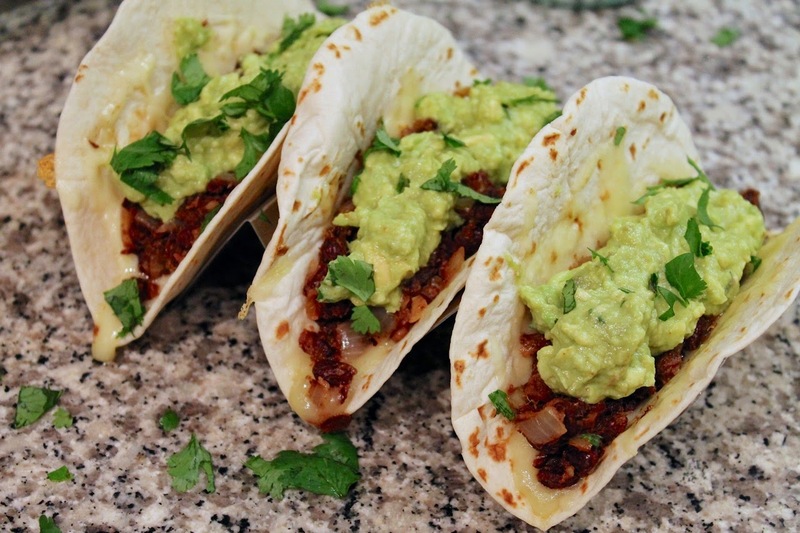 But tacos can be made vegetarian too, and for a week-night, it also makes them easier to prepare. Carnitas tacos are wonderful--if you have all day to make them. These Black bean and avocado tacos come together in just a few minutes. Since the black beans are the star, I wanted to enhance them a bit with onion, garlic, cumin, oregano and smoky chipotle chili powder. I also thought melting the cheese instead of sprinkling it on top would be nice, so I placed a handful of shredded cheese on the tortillas while they warmed on the griddle pan. The tacos are finished with a simple guacamole (gotta have it) and sprinkle of cilantro. 1. Make a simple guacamole: Place the avocado in a medium bowl. Squeeze the half-lime over the avocado, sprinkle with salt and, if desired, a little chipotle chili powder. Stir in a couple tablespoons of the chopped cilantro. 2. Heat olive oil in a medium saucepan over medium heat. Add onion and garlic and sauté until softened and lightly browned, about 10 minutes. Add the black beans, cumin, oregano and chili powder and cook about 5 minutes, then add a couple tablespoons of water, and cook another 5 minutes until the beans are a bit soft. Vigorously stir the mixture to break up some of the beans. 3. Heat a flat griddle over medium heat. Place two (or more if they'll fit) tortillas on the griddle and top with a handful of shredded cheese. Cook until the bottom of the tortilla is a bit crisp and the cheese has melted, about 2 minutes. Serve immediately topped with black bean mixture, a dollop of the guacamole, a sprinkle of fresh cilantro and, if desired, a dash of hot sauce. 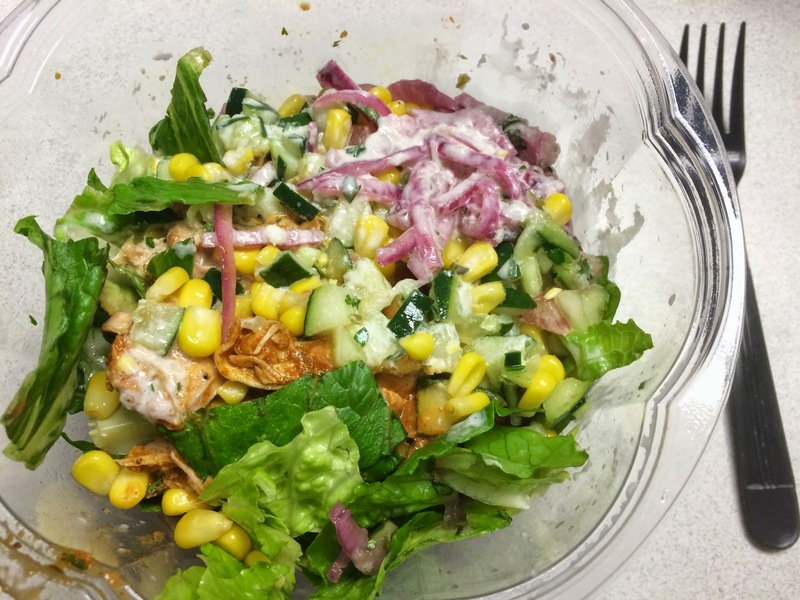 Usually when I make a salad it's mostly vegetables and they are generally raw. But they don't have to be. This simple salad--perfect for a weeknight dinner--contains a mixture of roasted, brined and raw salad ingredients, a wonderful mixture of savory, sour, bitter, salty and sweet flavors. To make this come together even faster on a weeknight, roast the vegetables the previous day so they are ready to go. I chose a mixture of red pepper, onion, zucchini and fennel for the roasted vegetables, along with sundried tomatoes, which I suppose are also roasted, just not by me. The vegetables made the kitchen smell really good while they were roasting. Not unlike the smell of a pizza topped with plenty of vegetables. As a counterpoint to the savory-sweet flavors of the roasted vegetables, I added the salty-sour flavors of brined ingredients--olives and capers. A little fresh mozzarella finishes off what makes a Mediterranean-style salad that's simple to make yet complex in flavor. 1. Preheat oven to 450 F. Combine cut red pepper, onion, zucchini and fennel in a bowl. Drizzle with 2 tbsp. of olive oil, dried thyme, salt and pepper and toss to coat. 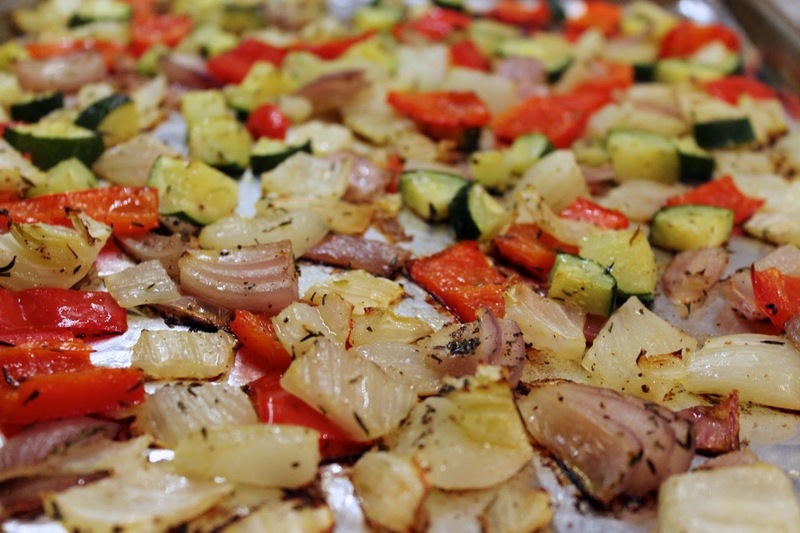 Spread the vegetables in an even layer on a baking sheet. Roast until the vegetables are tender and brown around the edges, about 30-40 minutes. Set aside to cool. 2. 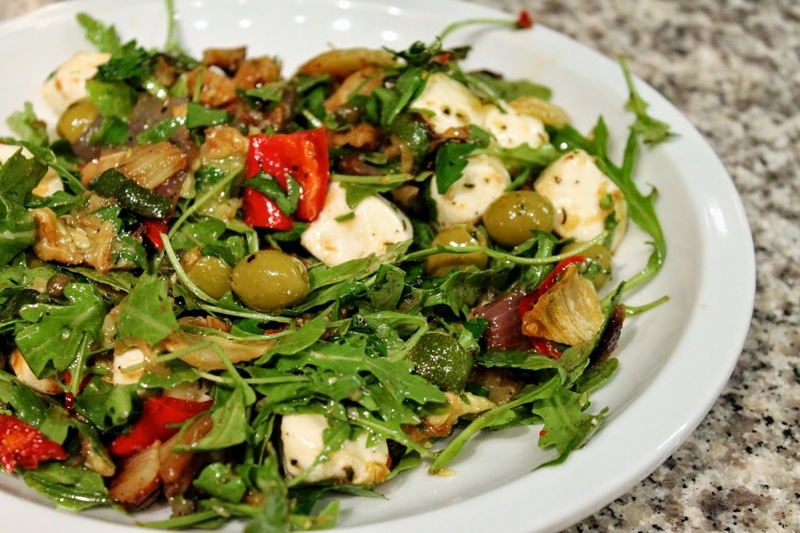 Combine the roasted vegetables, arugula, mozzarella, sundried tomatoes, capers and olives in a large bowl. Whisk together the remaining 2 tbsp. olive oil and the vinegar, pour over salad and toss to coat and combine the ingredients. Season to taste with salt and pepper and serve. 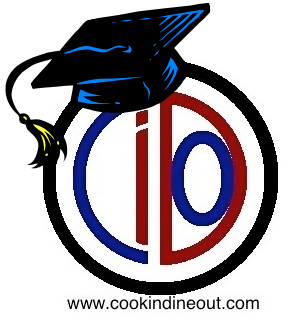 Cook In 101 focuses on basic recipes and cooking techniques to help novice cooks get into the kitchen and make delicious meals in a reasonable amount of time. Cake mixes are so tempting. They hold the promise of a bakery-perfect cake without much measuring or guesswork. They promise to save you time to, although, as I'll discuss below, they really don't. Mixes from the likes of Betty Crocker and Duncan Hines take up plenty of space on the baking aisle, along with their good friends: the ready-to-eat frostings. As a child, when I wanted to make a cake, I used a mix, and I'm not alone. I know lots of people use them. But I don't anymore, and here's why: a cake from scratch is not that much more work and it's sure to be more interesting and probably tastier. If you've never baked a cake from scratch before, you probably think it's going to use a lot of ingredients. Well, not really. You can make a basic yellow cake with as little as eight ingredients, fewer actually if you don't feel the need to add vanilla extract (but it makes it taste good) or if you use self-rising flour (that's flour that already has baking powder and salt in it). 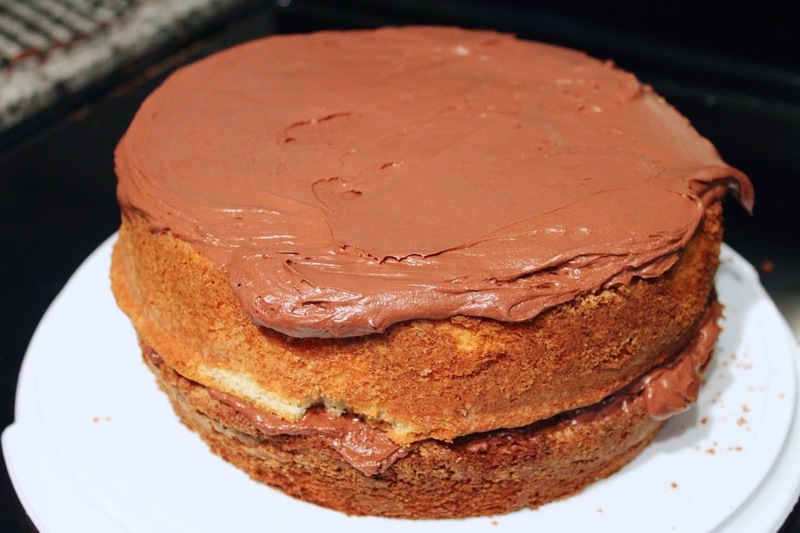 When you make a cake with a cake mix, you have to add other ingredients anyway, usually water, eggs and oil. So if you think a cake mix will help you avoid measuring and mixing, you're wrong. You can make a basic yellow cake with common ingredients you may already have on hand. Let's try it. 1-2-3-4 Cake: 1 cup butter, 2 cups sugar, 3 cups flour and 4 eggs. An old-fashioned yellow cake is sometimes called a 1-2-3-4 cake, a reference to the amounts of the cake batter's four principal ingredients: 1 cup of butter, 2 cups of sugar, 3 cups of flour and 4 eggs. After that, you need milk for moisture (the eggs alone will not be enough), baking powder and salt for leavening--i.e. making the cake rise (unless, as I mentioned, you're using self-rising flour) and vanilla extract, which gives the cake extra flavor. Note that I called this a "batter" and not a "dough." The difference? Batters have a higher proportion of liquid, making them pourable. So things like cakes, including pancakes, and waffles are made from batters. Cookies and breads are generally made from doughs. First step when making a cake is getting the equipment and ingredients together. You'll need two nonstick 9-inch round cake pans, one for each layer, a stand mixer (or a hand mixer), a mixing bowl (or two if using a hand mixer), measuring cups, a 1-cup liquid measuring cup, measuring spoons, a kitchen knife, a plastic knife, a spatula, parchment paper and a few toothpicks. For the cake pans, I recommend using nonstick pans with straight up-and-down sides (i.e. 90-degree angle with the bottom of the pan) and sides that are about 2-inches high. My pans are slightly smaller than this, and you'll see that because this recipe makes quite a lot of batter, there was a bit of "muffin top" expansion as the cake batter rose a bit above the rim of the pan in some places. This wasn't a serious problem--I just broke those pieces off--but if I'd have had deeper cake pans, it wouldn't have been an issue at all. Because the butter will need to be room temperature, you should set out the cubes an hour or two before you're going to be baking. If you forget to do this, you can soften the butter in the microwave, but do it carefully--short bursts (like 15-30 seconds) on a low-power setting. You do not want to melt the butter, as it won't behave the same way in the batter. Some people say you should also bring the eggs and milk to room temperature, although in my experience this isn't as important. Once you're ready to begin mixing, turn the oven on so it can preheat while you're mixing the batter. Before we get to the batter, let's prepare the cake pans. As baked goods go, cakes are fairly delicate. They tear easily. So care must be taken to prepare the cake pans so that you can remove the cakes from the pans without damaging them. Even if using nonstick cake pans, you'll want to prepare the cans with butter and flour and I also recommend using parchment to guarantee good release. 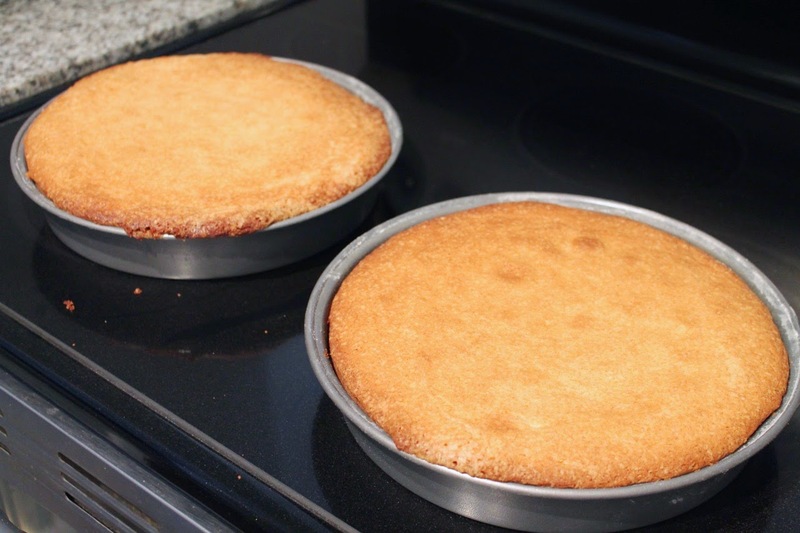 First, set out two 9-inch round cake pans. Take about 1 tsp. of butter, softened, and put it in the first pan. Using a paper towel or just your fingers, rub the butter on the bottom and sides of the pan until the whole thing is coated. Use additional butter if needed. Do the same thing with the other pan. Prep cake pans with butter, flour and parchment rounds. 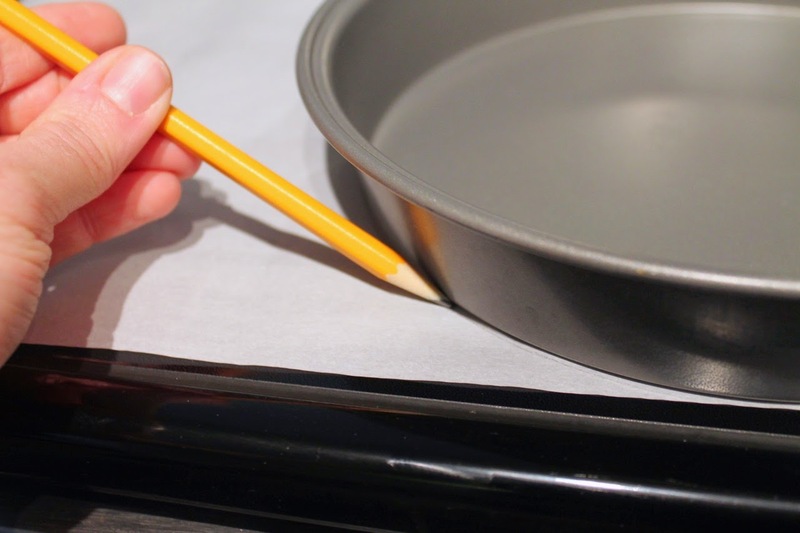 Set a pan on parchment paper and, using a pencil, trace around the edge of the pan. Do this a second time on another part of the paper. Cut out the circles (err on the inside of the line, so the circle is slightly smaller than the tracing). Place each round in the bottom of the buttered pan (the butter on the pan will help the parchment adhere to the pan) and, using about 1/2 tsp. of butter, butter the top of the parchment. Next, put about 2 tbsp. of flour in the first pan. 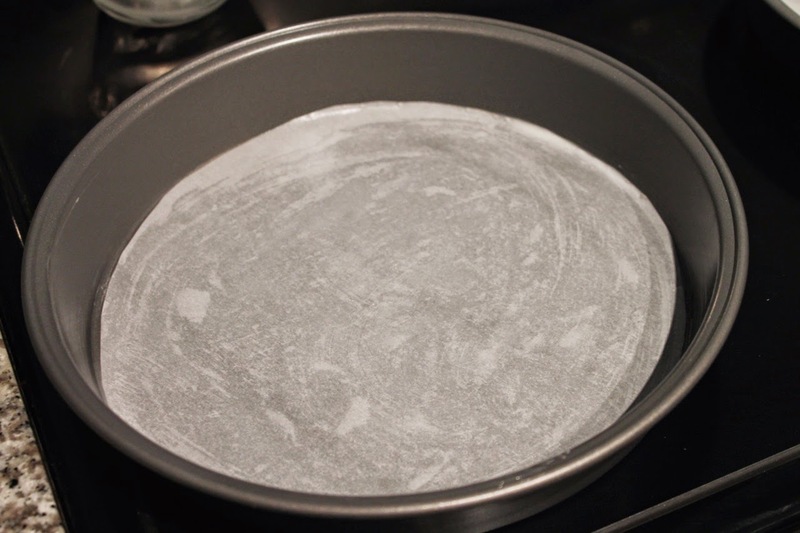 Shake it gently from side-to-side to coat the parchment, then turn it on its side and rotate the pan in a circular motion to coat the sides of the pan with flour. Tap the excess flour out into the second pan and repeat, adding more flour of necessary. Tap any excess flour from the second pan into the garbage. The dry ingredients (except the sugar) should be mixed together first. Add the flour, salt and baking powder to a large bowl and whisk them together. Pretty easy. The hardest part here is probably measuring the flour. Flour is finely milled wheat, and as such, there is actually a lot of air in flour. 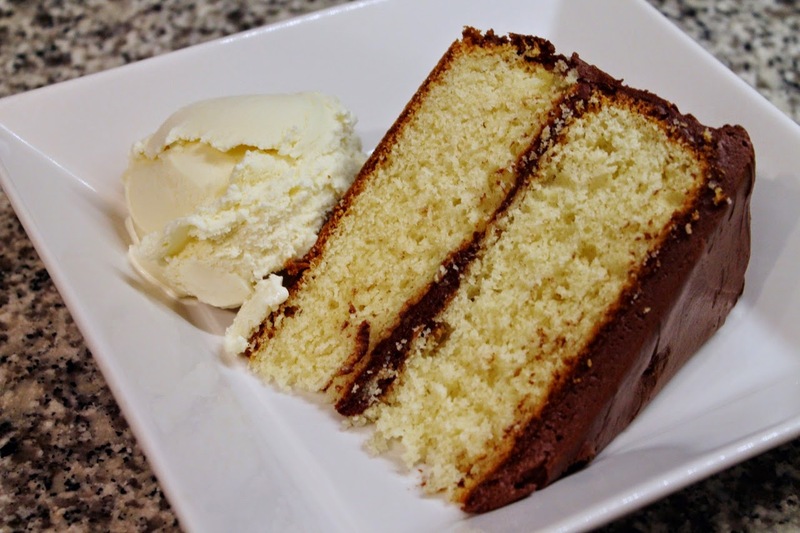 This is a good thing: air helps make your cake light and fluffy rather than dense and hard. 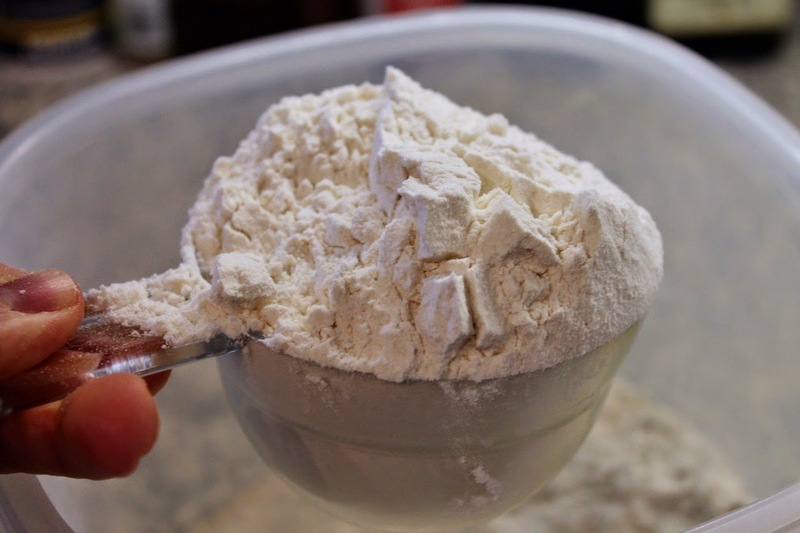 Use the "scoop and scrape" method to measure flour. 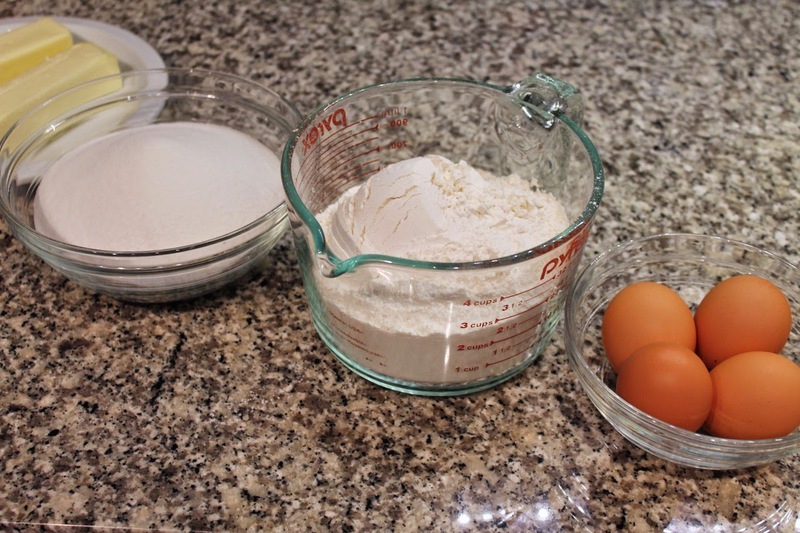 When measuring flour, you never want to pack flour in a measuring cup. This will result in adding too much flour to a recipe. Some people suggest sifting flour before measuring it, but this requires a sifting device and takes time. I find what I'll call the "scoop and scrape" method to be a reasonable compromise. Dip the measuring cup into the container of flour (flour should be stored in an air-tight container, never in the sack you bought it in). The flour should be mounded a bit on top. Grab a knife with a flat edge and scrape the excess flour off the top of the measuring cup, so that the top level of the flour is now even with the top edge of the measuring cup. Remember, no compacting; you're just scraping. The baking powder and salt are easier to measure. Just use measuring spoons and level off the top either by shaking off the excess or using a knife (some baking powder containers have an opening with a straight-edge just for this purpose). Next, mix the other ingredients. If you have a stand mixer, you'll be using its bowl. If not, choose a large bowl you can use with a hand mixer that will hold all of the ingredients. Add the butter first and beat it on high speed (if using a stand mixer, you want to use the paddle attachment). The butter will become creamy as it softens and air starts to work into it. Remember what I said about the air in the flour? Well, you can work air into the butter too, but not if it's melted--it might get a little frothy, but the bubbles will dissipate. Next add the sugar to the butter on low speed (always add ingredients on low speed to prevent the mixer from sending them flying all over the kitchen) and continue mixing a high speed until fluffy. This process of mixing sugar into butter is sometimes called "creaming," and it's an important step for further incorporating air into the batter. The America's Test Kitchen book, The Science of Good Cooking, has a wonderful discussion about the science behind this step, as well as why too-cold or too-warm butter won't work. Next add the eggs. When adding eggs to a batter, never break the eggs directly into the mixture; always break the egg into a separate container, like a 1-cup glass measuring cup, then add to the mixture. 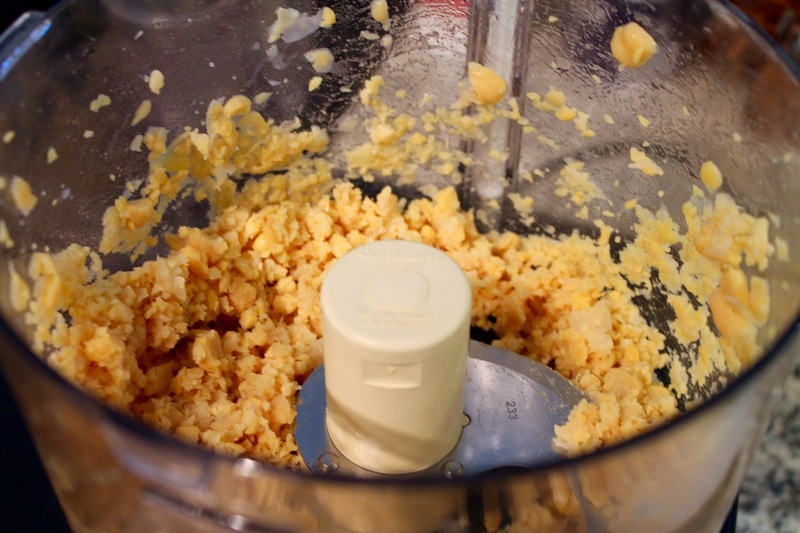 If the egg is bad, you won't have ruined your batter and if any little pieces of shell break off, you can easily fetch them from the container--not so easy if they land in the batter with the mixer running. Add the vanilla extract last. Stop the mixer and use a spatula to scrape down the sides of the bowl. Then run the mixer a little more to make sure the mixture is fully combined. Now that the dry and wet ingredients (except the milk) are mixed, it's time to combine them. With the mixture set on a lower speed, first add about half the milk. When it's mostly blended in, add half the dry ingredients. Then add the rest of the milk and finally the rest of the dry ingredients. Why do it this way? If you add the dry ingredients first, the cake batter will clump up and become harder to mix. If you add all the milk first, it will thin out too much. Doing this parts results in the best texture for the batter, and thus the best texture for the cake. Once mixed, the batter is ready to be transferred to the prepared baking pans. Pour half the mixture in each pan--divide it as evenly as possible so the two layers of the cake will be about the same thickness. Using a spatula, smooth the top of the cake, making it as even as possible. If the edges are a little higher, that's fine. The cake will rise as it bakes, and the center will rise the most. You don't want the batter mounded in the middle, as that will make the rounding more pronounced after the rise. By now, the oven should be hot enough from pre-heating, so place the two cake pans of batter in the oven, ideally on the same rack. Bake until the cakes are golden on top. Remove one from the oven and insert a toothpick in one. If it comes out clean, the cake is done. If there's any wet batter clinging to the toothpick, let it back another 5 minutes and repeat the toothpick test. If the cake is slightly overbaked it will just be a bit dry, whereas if it's underbaked, it will be gooey, which is gross unless you're making chocolate lava cake. The cakes should be done after about 25 to 30 minutes. Remove them from the oven and set them on wire racks to cool for about 15 minutes. Here are the cakes fresh from the oven. Notice how the batter overhangs the edge of the pans a little bit. This indicates that I filled the cake pans a little too full. It wasn't a major problem--I broke those pieces off before frosting the cake--but ideally I'd have used slightly taller cake pans to prevent this. Using the plastic knife (as to not damage the nonstick pans), carefully run the knife around the edge of each cake to loosen it from the pan. Place the cooling rack on top of the cake pan and invert the rack and pan. The cake should slide out of the pan onto the rack--tap the bottom of the pan lightly if it doesn't. Carefully remove the pan, then remove the parchment round. The bottom of the cake should be nicely browned and, because you carefully buttered, floured and parchment-lined the pan, not torn. Repeat with the other cake. Leave the cakes on the racks until they are completely cooled. They are now ready to be assembled and frosted. An offset spatula works best for frosting a cake, but any spatula will do if you don't have an offset. You could probably even use a knife, but it might be a more difficult to make it smooth. You're going for a nice even layer somewhere between 1/4 to 1/2-inch between the two cake layers, on top and on the sides. Start by placing the first layer of cake with the flat side (the side that was on the bottom of the cake pan) down against the cake plate. 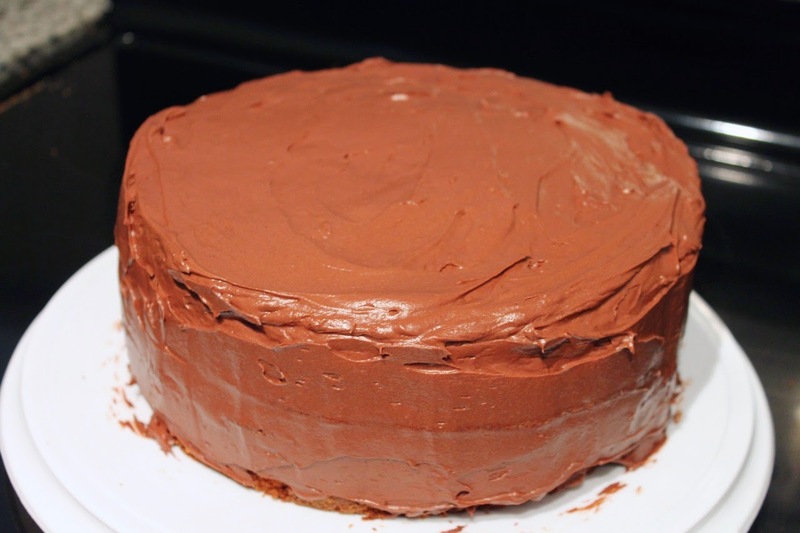 Spread about 1/3 of the frosting on top of this cake, smoothing it into an even layer with the spatula. Next, carefully slide the second layer of cake on top of the frosted layer. This second layer should have the flat side on top--so the two flattest sides are the bottom and top of the cake, while the more uneven sides are sandwiched with the frosting in the middle. Spread another 1/3 or so of the frosting on top. It's okay if a little runs over the side. Lastly, spread the final 1/3 of the frosting along the side. I like to do this in little batches, spreading the frosting against the top layer then smoothing it into place by running the spatula vertically along the side of the cake, working in a circle until the entire side is frosting. Any extra frosting in the bowl? You could put more on top, or you could eat it (i'd eat it). 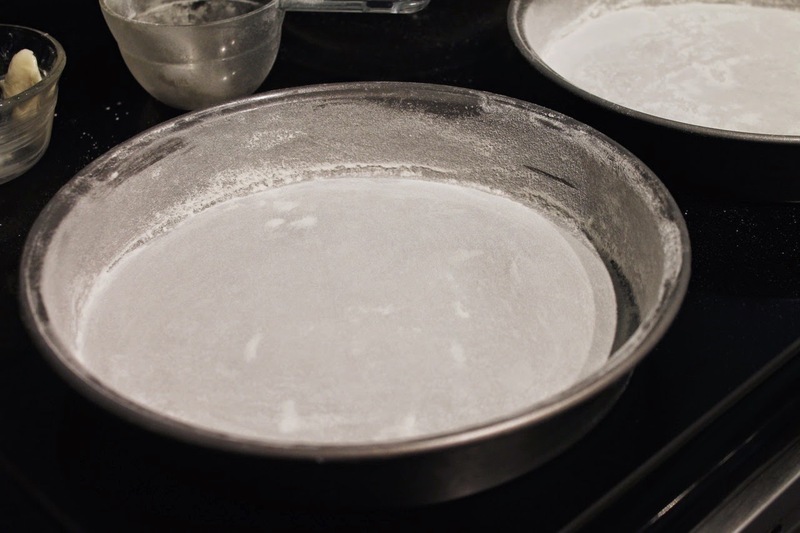 Use butter, flour and parchment to prep nonstick cake pans. Make sure the butter is room temperature before beating it. Beat the butter and sugar until light and fluffy, incorporating air into the batter. 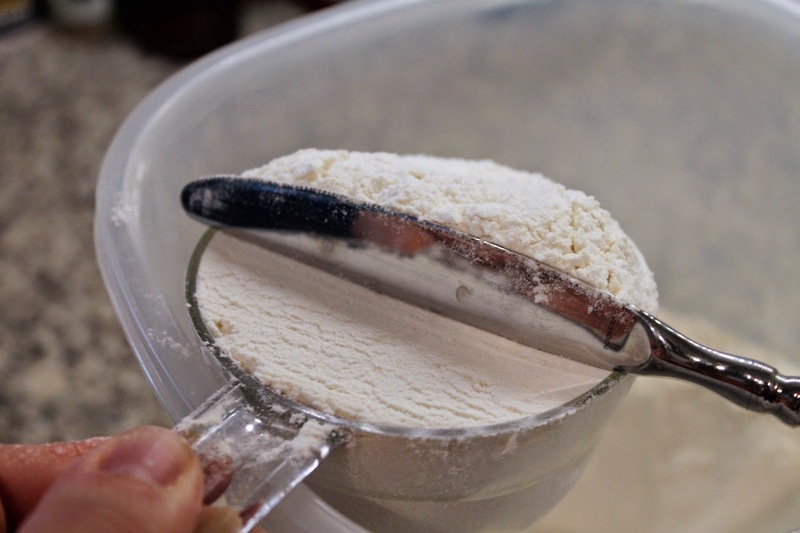 Measure flour using the "scoop-and-scrape" method. Alternate adding parts of milk and the dry ingredients when combining with the butter-sugar mixture. Smooth the top of the cake batter in the pan before baking. Use a toothpick test to know when the cakes are done. Let the cake cool in the pan about 15 minutes before inverting it to remove to remove the cake. 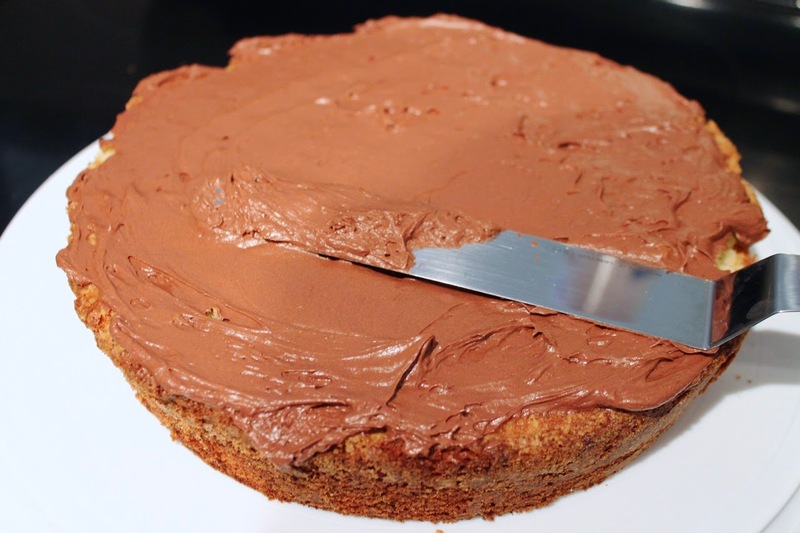 Use a plastic knife to remove cakes from nonstick cake pans. 2. Butter, flour and line with parchment two 9-inch nonstick cake pans (ideally 2-inches deep). 3. Add flour, salt and baking powder in a large bowl and whisk to combine. 4. 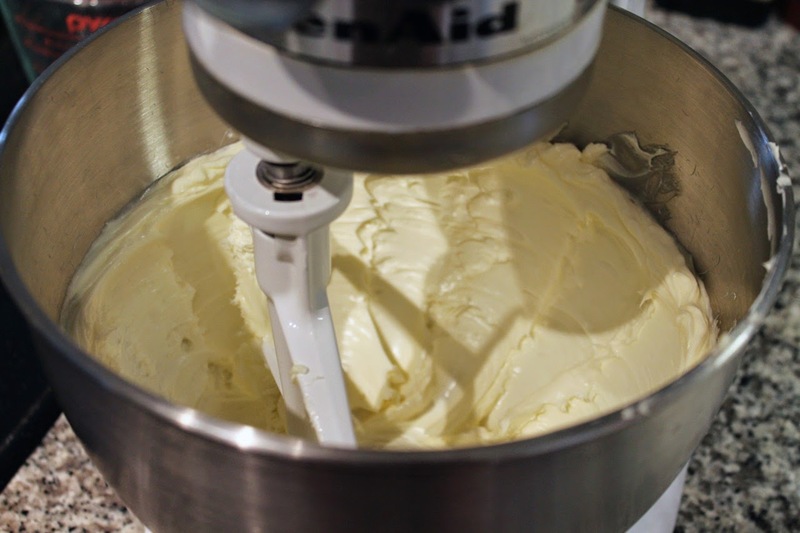 Using a stand mixer or hand mixer with a large mixing bowl, beat the butter on high speed until very creamy. Add the sugar; beat on low speed to incorporate, then on high speed until the mixture is light and fluffy, about 5 minutes. Beat in the eggs one-at-a-time at low speed, then beat in the vanilla extract. Increase speed to high and beat 2-3 minutes. 5. With the mixer running on low speed, add about half the milk to the batter, then about half the combined dry ingredients, the other half of the milk and the other half of the dry ingredients. 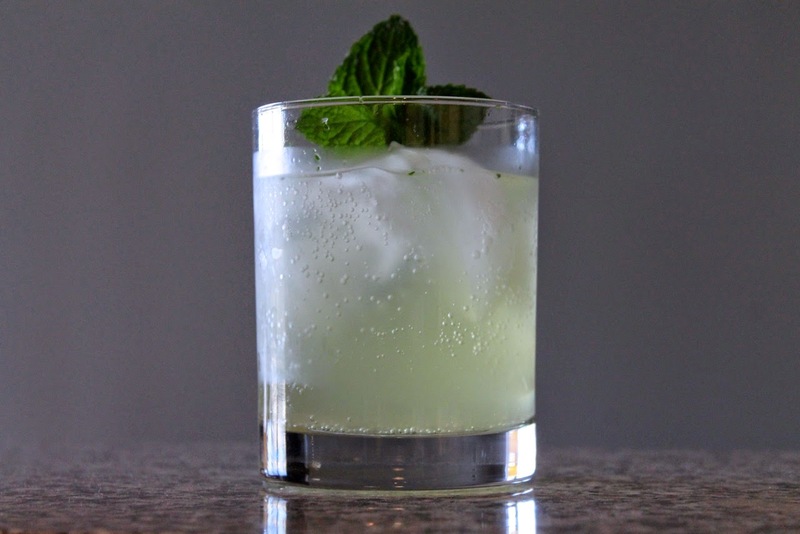 Beat just a little bit longer until the ingredients are combined. Scrape down the sides of the mixing bowl and beat a few more times until combined. 6. 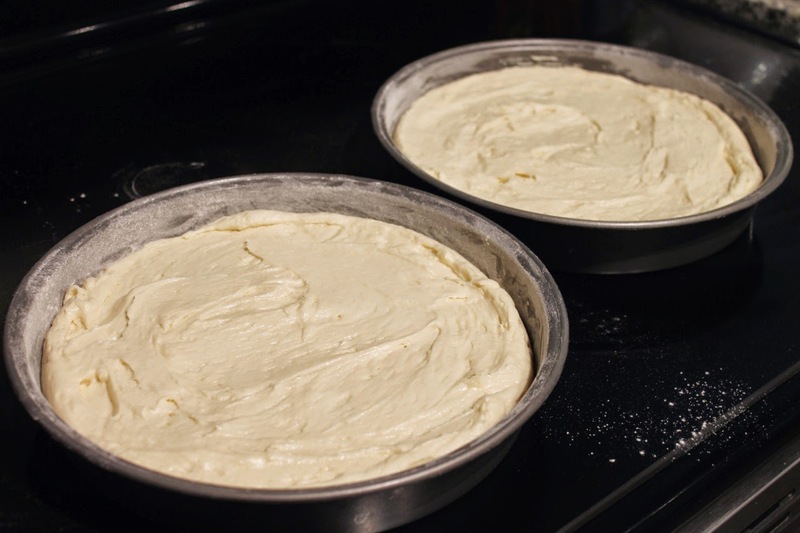 Pour the batter divided evenly among two prepared cake pans. Smooth the top of the batter with a spatula. Bake until the cakes are lightly browned on top and dry in the center (a toothpick should come out clean when inserted into the center of the cake), about 25-30 minutes. Remove the cakes from the oven and set on individual cooling racks to cool for 15 minutes. 7. Run a plastic knife around the edge of each cake. Place the rack on top of the cake and invert the cake pan and the rack, allowing the cake to gently fall out of the pan onto the rack. Remove the parchment. Repeat with the other cake. Allow the cakes to cool completely before frosting. 8. To frost the cake: Place the first cake right-side-up so the flat surface that was on the bottom of the cake pan is touching the cake plate. 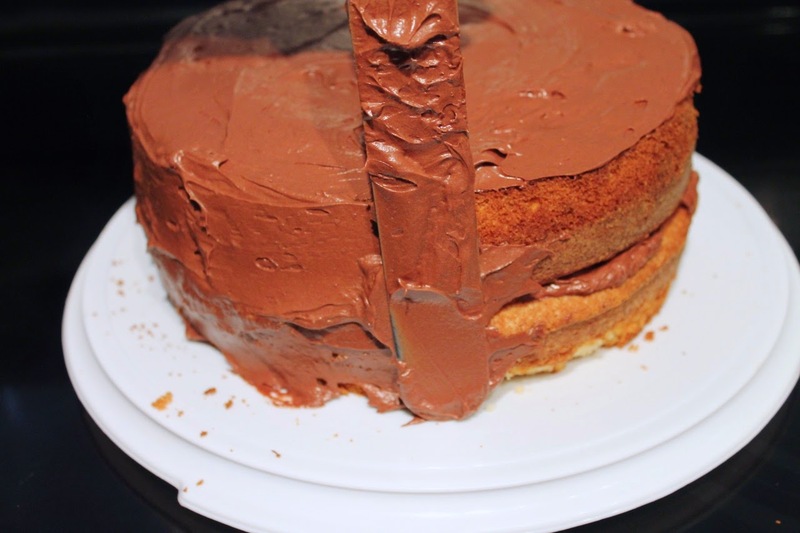 Using a spatula (preferably a metal offset spatula), spread about 1/3 of the frosting on top of the cake in an even layer. Invert second cake layer and carefully slide it on top of the frosting, so that the flat surface that was on the bottom of the cake pan is now on top. 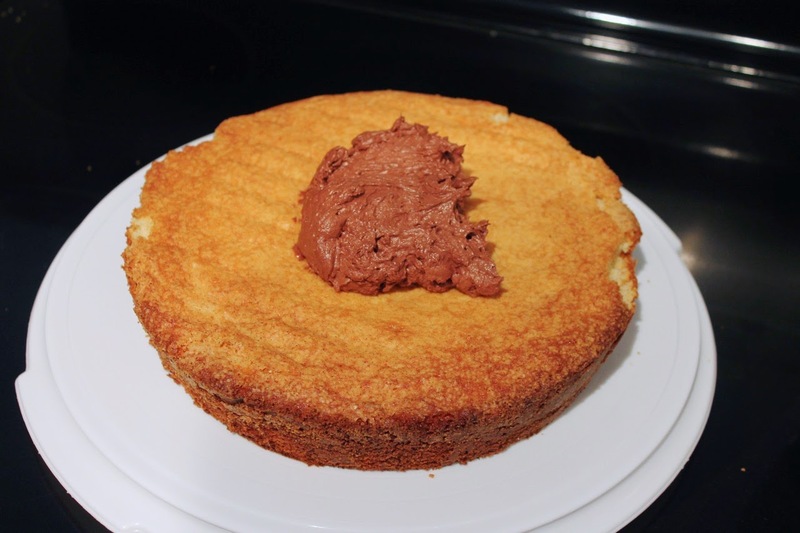 Spread about 1/3 of the frosting on top in an even layer, then spread the rest of the frosting on the sides of the cake, adding about 1/3 cup of frosting to the cake and smoothing the frosting by holding the spatula vertically and moving it along the side of the cake. Even the top with the spatula. Refrigerate until ready to serve (you may want to allow the cake to warm up slightly before serving). Homemade frosting is so much tastier, in my opinion, that store-bought. Frosting is pretty easy to make, especially if you use this no-cook recipe. This is a simple powdered-sugar frosting. It has that slightly grainy texture that I love. 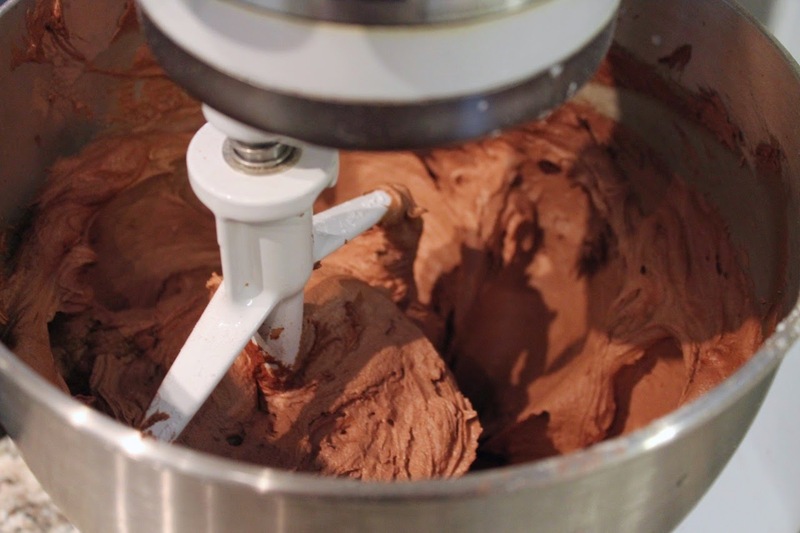 Add butter to the bowl of a stand mixer (or mix in a large bowl with a hand mixer). Beat on high speed until creamy. Add the cocoa power, powdered sugar, milk and vanilla extract. Beat on low speed until combined, then on high speed until thick and creamy. Scrape down the sides of the bowl with a spatula and beat a few more times until the frosting has an even consistency. Use immediately to frost the cake. If you refrigerate it before doing so, be sure to let it set out so that it softens a bit before using it to frost the cake. I make pasta a lot, and during any time except July-September, if it contains tomatoes they are canned. The grocery store is acutely aware of the association between pasta and canned tomatoes. The dried pasta is located on the same aisle as the whole, diced, crushed, pureed and pasted (if that's a word) tomatoes. 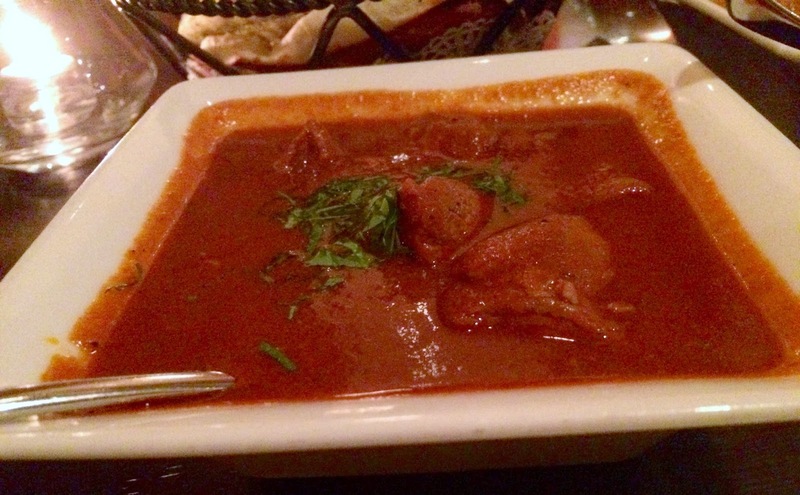 Your De Cicco and San Marzano and just a mere feet away, waiting for you to combine them into something wonderful. There's another specter on this aisle though: the jarred pasta sauce. And it's a demon. I haven't bought this stuff for years, but checked up on them recently. I see they now sell them with cheese already mixed in--can't imagine that does great things for the cheese. Several also bill themselves as being "with meat," but don't specify which meat. According to the ingredients, it's beef, which is only slightly more descriptive--I'm going to assume we're talking ground beef. One such sauce also contains soybean oil (more of it than beef) and "natural flavor" whatever that is (based on what I've read, it could be just about anything cooked up in a lab somewhere). And many of them have added sugar, which good tomatoes just don't need. If I'm sounding rather snooty about jarred pasta sauce, I don't apologize for it, and here's why: you can make something far better yourself using canned tomatoes. 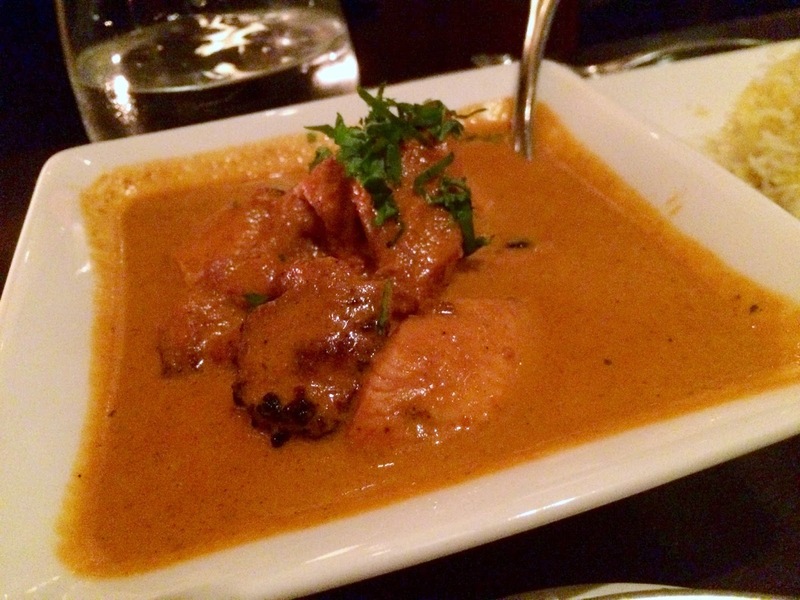 It's not hard to whip up a simple sauce. And you can do it in the time it takes to boil the noodles. After putting a pot of water on the stove to boil at 6:45 (which takes about 15 minutes), this dish was ready at 7:10. And it was good, really good. 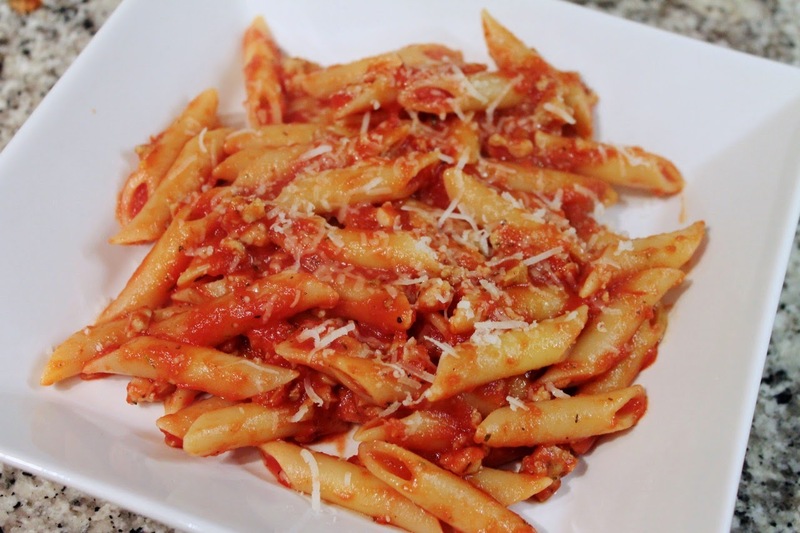 So next time you're in the mood for simple pasta with tomato sauce, pick up a few extra ingredients and skip the jarred stuff. You'll be much happier. A word about grana padano, the cheese I used. I first learned about it last summer while reading Molly Wizenberg's memoir Delancey. It's one of the cheeses she said they use on their pizzas. I've been searching for it ever since. Although I've read that grana padano is more prevalent than parmigiano-reggiano, in my experience, it's harder to find in the United States. Our Whole Foods doesn't have it, and I once helped an employee of a specialty deli search through her cheese case looking for the grana padano they were supposed to have (we couldn't find it). Then one recent weekend at Giant, I came across a display of it at the end-cap of the specialty cheese case. Yes, sometimes the conventional grocery store does have things you can't find elsewhere. This is a hard Italian cheese similar to parmigiano-reggiano, both of which are types of "grana" cheese (there is a third primary type, grana trentino, that I've ye to try). I tried slices of both cheeses side-by-side. Their flavor is very similar. 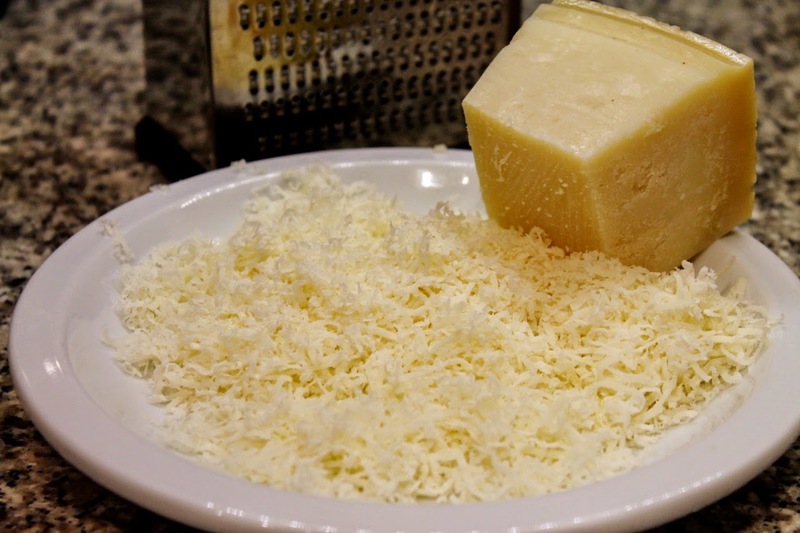 Unless you're a real cheese expert, if someone fed you a spoonful of grana padano, you would probably say it was parmesan. 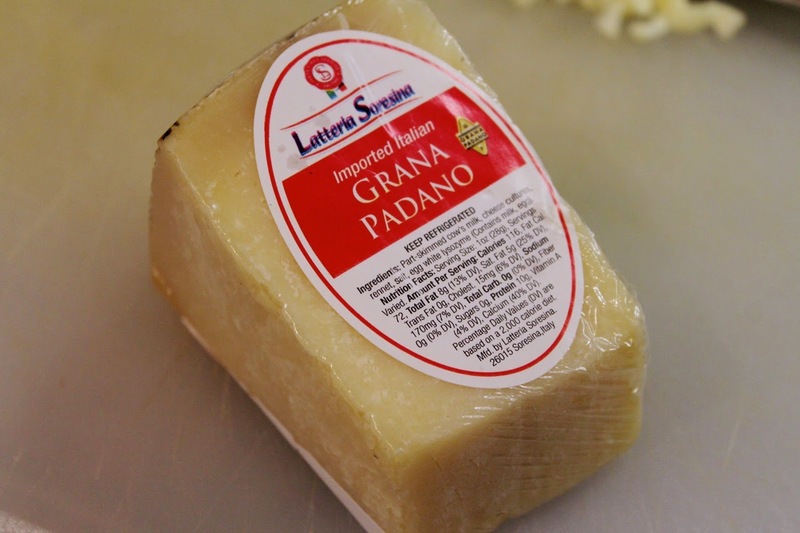 The grana padano is a slightly milder flavor--you don't get quite that nutty taste of parmigiano-reggiano, and the texture is also a bit softer--there isn't any of that slight crunch you get with parmigiano. If grana padano does become easier to find, I might buy it more often, especially if it is less expensive. 1. Bring a large pot of salted water to boil. Cook the pasta according to package directions for al dente. Drain and set aside. 2. In a large pot, such as a Dutch oven, heat 1 tbsp. olive oil over medium heat. Add the sausage and cook, breaking up with a spoon, until no longer pink and lightly browned in places. Remove from the pan, transfer to a cutting board and chop fine. 3. Add the other tbsp. olive oil to the pot. Add the garlic and red chili pepper flakes and cook until fragrant, about 1 minute. 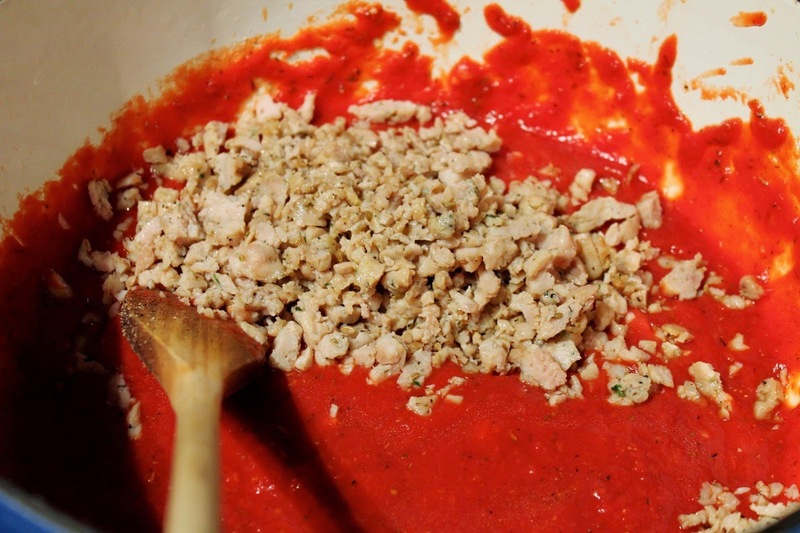 Add the crushed tomatoes and thin with about 1/2 cup of water. Season with oregano, thyme, nutmeg, salt and pepper. 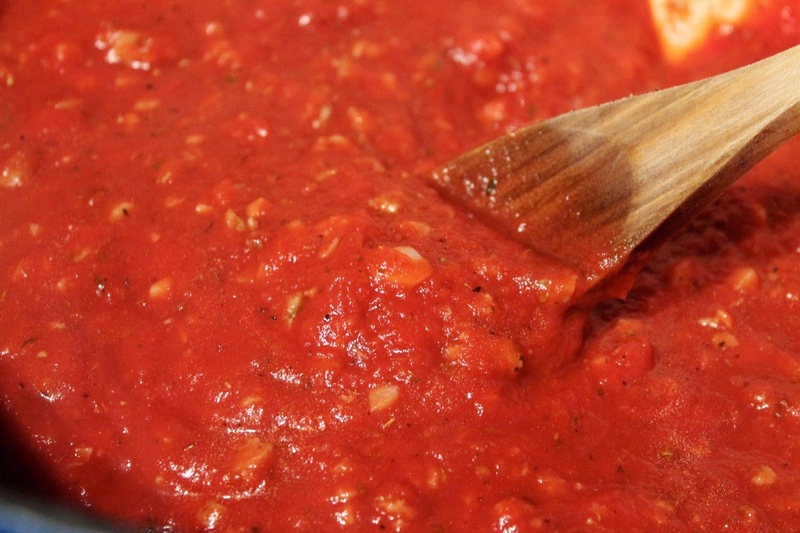 When the mixture begins to sputter, reduce the heat to medium-low and simmer a few minutes (if you're doing this while pasta is cooking, give it about 10 minutes). 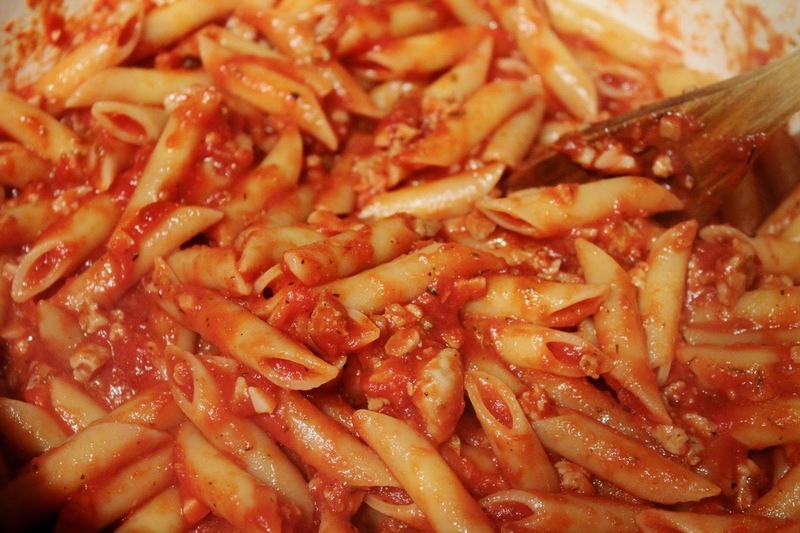 Turn off the heat and stir in the pasta to coat it with the sauce. Serve the pasta in shallow bowls with the grated cheese at the table.